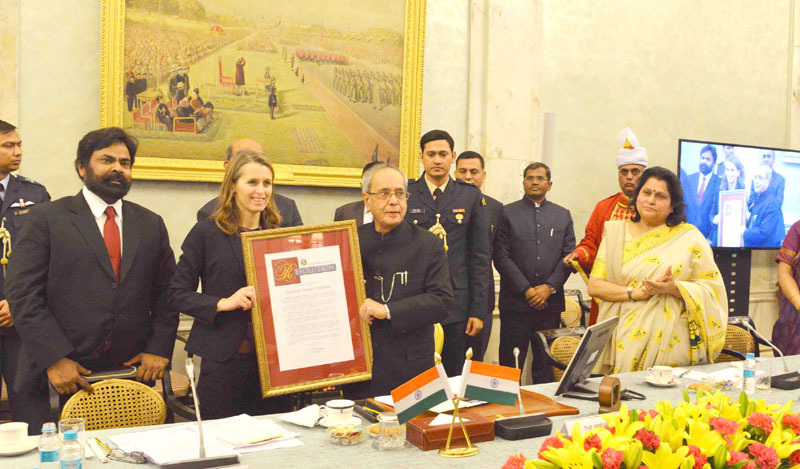 The President of India, Shri Pranab Mukherjee received Garwood Award for ‘Outstanding Global Leader in Open Innovation’ from UC Berkeley-Haas School of Business today at Rashtrapati Bhavan. The University of California, Berkeley, one of the most prestigious educational institutes in the world, has established the Garwood Award to acknowledge individuals who have embraced, supported and encouraged open innovation in a significant and impact way. The award was presented to the President for promoting open innovation; for taking initiative of hosting and gathering global innovators at the first-ever Global Round-table on the Inclusive Innovations at Rashtrapati Bhavan; organizing first Festival of Innovation at the Rashtrapati Bhavan to link together global leaders from technological, financial and educational sectors for the promotion of increased scalability in national and international grassroots innovation; for launching the first Innovations Scholars’ ‘In-Residence’ programme to promote the spirit of innovation and provide a thriving creative atmosphere for grassroots innovation activities that will have the potential to transform the global landscape; for urging higher education leaders to establish Innovation Clubs to catalyze the collaboration between institutions of higher learning and grassroots innovations; for being a primary supporter of Micro-Venture Innovation Finance which empowers grassroots innovators with the fundamental resources to provide their products and services to global markets; for being an initiator for innovative solutions towards financial inclusion via national programs that will promote worldwide economic success and for spearheading the establishment of an Innovation promotion platform involving academics, entrepreneurs, and researchers to foster an intercontinental medium of innovation, R&D and scientific research. In his acceptance speech, the President said that open innovation is a way to future as it captures knowledge-flow from all sources, both internal and external, in an organization. Open innovation is most essential for government entities, who are tasked to serve the citizens. Placing of data in the public domain without compromising the privacy, promotes transparency, innovation and opens up new avenues to solve problems of citizens efficiently and effectively. The President said that innovation is a critical driver of growth and development. Open innovation takes the innovation to next level and creates a new eco-system of access and equal opportunities to all. Open innovation has a potential to transform the global social landscape and help achieve the goal of a more fair and just world.